Di sclaimer: I finished reading this book a week or two ago. Then I found out it was this week’s #BookFaceFriday. I couldn’t resist the temptation. “A beautiful computer hacker and a bad-boy FBI agent must collaborate…in more ways than one…” Sometimes Goodreads just has the perfect descriptions. 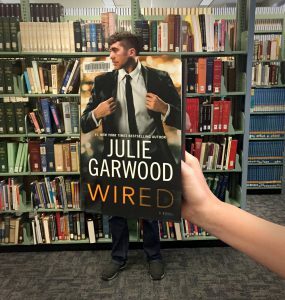 I can’t describe Wired by Julie Garwood any better than that. In this book, Allison Trent is a freakishly brilliant computer hacker who has a day job as a supermodel. Yes, you heard me. Liam Scott is an FBI agent with a prickly exterior who is in a bind and needs a freakishly brilliant computer hacker to casually break into the FBI servers. He is ready and willing to break every rule in the book to complete his mission. But, don’t worry, he has a heart of gold. Allison would love to help, but she has a super secret double life she doesn’t want anyone to know about! Fear not, I didn’t give any spoilers here. The reader knows about her double life nearly from page one. She is casually breaking a few rules of her own to use her super secret computer powers for good. You may have noticed this, but Wired is a romantic suspense novel. This book is probably not going to radically change the way you see the world. But it sure is entertaining. Every page you turn reveals a new plot line fresh out of the Romantic Suspense Book of Clichés. It was deliciously predictable in all the right ways and was the perfect way to relax on a lazy weekend. Read it to find out if two prickly people with a secret heart of gold can collaborate…in more ways than one. This entry was posted in Books & Reading, General and tagged #FridayReads, Book Review, Friday Reads, Julie Garwood, Wired. Bookmark the permalink.